Japan GT Championship (GT300 class) for detuning Street has played a race car, but this was TRD2000GT development. 30mm tread by extending one side is an exceptional sports car MR-aims to further enhance the performance of the two sports. With the wide body of, the suspension uses lightweight, high-stress the spring and a newly developed low Furikushonshokkuabusoba. Behavior while smooth, has achieved excellent responsiveness. The new mechanism is a mechanical drive system developed by the new LSD equipped to convey the road surface without exhaustive output to 260 horsepower engine that pulls Supotsudoraibingu performance thoroughly. 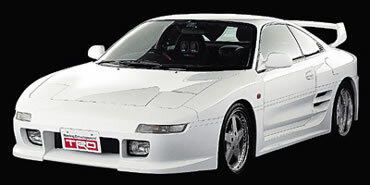 In TRD, MR-2 owners "super MR2 People can make different cars mackerel!" The suggestion that, in late spring after plans to start selling kits. It requires modification application procedures and application forms are Of course I will provide in TRD. ^^ Very nice..... does this have 001 on the front plaque?? It does yes - check out pic of vin plate above. this is in no way a dig at mick aka (topgun) but i would put my left arm on this being the genuine 001? with the heritage that comes with this car.